May 2015 is National Water Safety Month, but we want to make sure that all our Charleston residents are safe in the water all year ’round. Life Jackets – Whenever you’re out on the water, it is important to wear a life jacket. Life jackets are proven to save lives. Children under six should always wear a life jacket when they’re on the water, and anyone operating a jet ski or other personal water craft should have a life jacket on. Life jackets should fit snugly so it can’t slip off, without being too tight that you are uncomfortable. Boat Safety – Never drink and drive a boat. According to the American Boating Association, over 30% of boating accidents in 2013 involve alcohol. People who are under the influence of alcohol are ten times more likely to be involved in a boating fatality than people who are not. 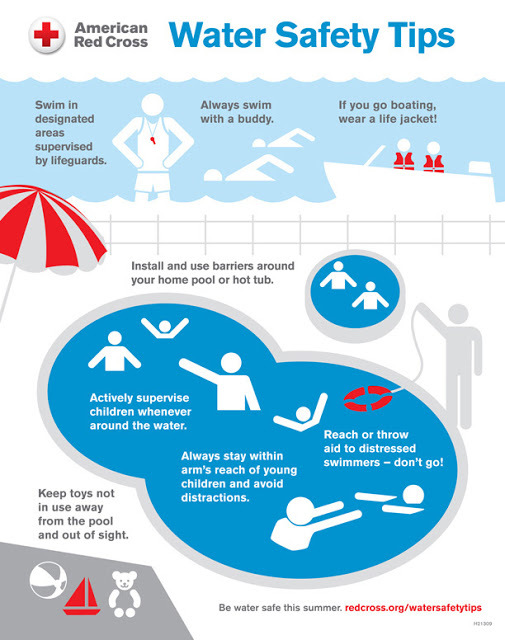 Water & Kids – Keeping children safe by the water is no easy task. Parents must be vigilant, focused, and teach children the correct ways to deal with the water. Always watch children who are playing in the water and help them learn to swim with classes and certifications. Parents should learn CPR and re-up their certifications each period. Sun Safety – Being out at the pool or beach also means you and your family will have much more sun exposure. Limit your family’s time in the sun and always wear sunscreen and protective clothing. Watch for signs of heat stroke or sun stroke, and encourage the drinking of water to avoid dehydration. Check Ocean Conditions – Swimming in the ocean can be an exhilarating experience, but it can also be dangerous. Always check tide and weather conditions to make sure you avoid rip tides and dangerous currents. Never swim alone and always listen to the lifeguards! If you and your family are in need of medical care over the summer, look to the trained and experienced physicians at Alpha Care. Our offices in Charleston, SC are conveniently located for you to get the care you need when you need it. Find us in James Island, North Charleston, Summerville, and Mount Pleasant. To make an appointment call us today at 843-824-2273 or contact us online to get a diagnosis and treatment with our specialists. No referrals are needed and same day appointments are available.